The Chicago Art Institute in Chicago, Illinois, is showing Japanese Kimono, 1915–1940: From Tradition to Ready-to-Wear from June 16–November 13, 2011. This exhibition explores the role that traditional motifs, techniques, and modernization played in the development of pattern design in women’s kimono and haori, a short kimono-like jacket. Photo is the Art Institute’s. 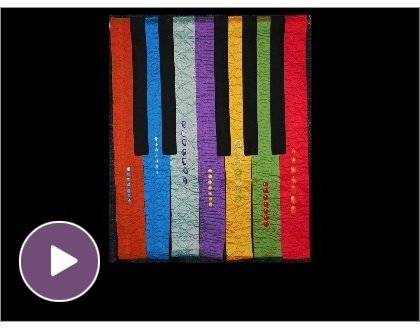 Infinity Art Gallery is showing its Fiber Arts 2011 Show online. http://www.infinityartgallery.com/fiber-arts/gallery/ is where the works are shown. View the gallery and show award winners online. The 2011 Gateway to Imagination National Juried Art Competition is showing at the Farmington Museum in Farmington, New Mexico, now through July 9, 2011. The exhibition will feature 95 artworks selected from over 300 entries. Tev Schuetz and Nick Schanz have an exhibit of their ceramic sculptures at Ashland Gallery, 6537 Carrollton Avenue, Broadripple, in Indianapolis, Indiana, now through June 4, 2011. The opening reception is Friday, May 13th from 5 to 9PM. Come by and see their work and enjoy the evening! The exhibit has been so popular that it is being extended through the end of June. Layered Textures: New works by Carol Ann Waugh is on exhibit at Ice Cube Gallery in Denver, Colorado, now through May 21, 2011.
www.icecubegallery.com is where you can find more info. You are currently viewing the archives for May, 2011 at Woodhaven Studio's Weblog.